Love is a decision, or is it merely an emotion? Eight years after Tony and Hope's affair ended, new problems arise. Jimmy has gone off to college, but returns home with a startling revelation that devastates his father and causes his final heart attack. Now Hope is grieving the loss of both her husband and their son. She tries to make sense of everything, and in the end she decides to love her son through the grief. More than that, she makes the decision to love whoever her son chooses to love, whether she agrees with his choices or not. Tony's life has its own disaster tearing through it. First, he is accused of killing his ex-wife, but he is soon released once the authorities realize he had nothing to do with it. The tragedy with his ex led to some major changes in his life, however, and some soul-searching that ultimately turns Tony's life around. While he is still adjusting to his new perspective on life, his long-lost daughter Nina contacts him and has some secrets of her own. He is overjoyed to be reunited with his daughter, but with their relationship comes an entirely new set of challenges. Jimmy is confused about his faith, his life, and ultimately, whom he should love. After some severe trials knock him off what he thought was the right course for his life, he makes the decision to love himself enough not to be used by someone again. But will his decision protect him in the end? Oh wow. I'm really not sure where to start. First, I have not read any of the other books in this series or by this author, Michelle Sutton. I really didn't know what this book was going to contain. I knew the basics, that it was about a man and woman who were trying to overcome their past affair. I didn't know the characters personalities. I went into this blind. Which is okay. Normally, I don't like to jump into the middle of series but I wanted to give it a chance. When I started reading I realized I wasn't going to miss out on anything. The author was very good about giving past details. So I didn't feel like I was I missing a piece of knowledge I needed to enjoy this book. Knowing this was a Christian book, at first I was a little shocked by the details and subject matter. Now, I'm not picky. I've read much riskier books. It was only after I had read it that I learned it was considered an edgy Christian fiction. Some people might not want to read a book like this. In this book you have a story that touches on delicate subjects. But subjects that are real to life. People are dealing with this every single day. Sexuality and lust are a part of everyone. It's how we decide to deal with it that really matters. 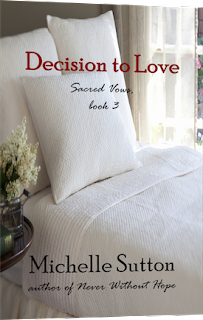 Michelle Sutton dives right in and shows us the struggles that men and women alike are going through and how they can rely on God to help them make their decisions...which results in the title of the book, Decision to Love. I really enjoyed the book. It left me thinking about my past choices, and how I'm teaching my children about the choices they will need to make and how they can honor and rely on God to help them to make the right choice. Really excellent book. Michelle Sutton is a social worker (and now supervisor) who has been writing romantic fiction with an inspirational message for over nine years. Southeastern Arizona is where Michelle calls home. She loves being surrounded by mountains and fresh air, which inspires many of her novels. She and her husband are approaching twenty-two years of marriage and their two sons will begin their third year of college in August. She is the author of well over a dozen novels in print and is a member of American Christian Fiction Writers, as well as an avid book reviewer and blogger on a variety of sites. 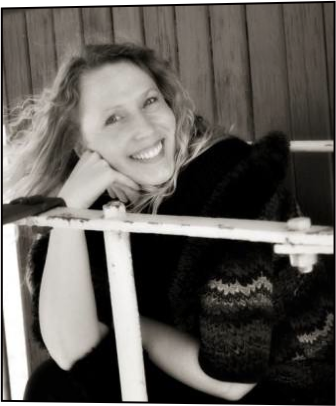 She founded Edgy Christian Fiction Lovers social networking site which has nearly 1200 members. Crafting new stories and reading/reviewing great books is her idea of a fun time. You can find Michelle on her website, Facebook personal page, Facebook fan page, and on the Edgy Christian Fiction Lovers social network. Decision to Love can be purchased on online at Amazon, CBD, Barnes and Noble or directly from her page.